Lindtjorn B, Mitike D, Zidda Z, Yaya Y. Reducing stillbirths in Ethiopia: Results of an intervention programme. PLoS One. 2018;13(5):e0197708. Epub 2018/05/31. doi: 10.1371/journal.pone.0197708. PubMed PMID: 29847607. Previous studies from South Ethiopia have shown that interventions that focus on intrapartum care substantially reduce maternal mortality and there is a need to operationalize health packages that could reduce stillbirths. The aim of this paper is to evaluate if a programme that aimed to improve maternal health, and mainly focusing on strengthening intrapartum care, also would reduce the number of stillbirths, and to estimate if there are other indicators that explains high stillbirth rates. Our study used a “continuum of care” approach and focussed on providing essential antenatal and obstetric services in communities through health extension workers, at antenatal and health facility services. In this follow up study, which includes the same 38.312 births registered by community health workers, shows that interventions focusing on improved intrapartum care can also reduce stillbirths (by 46%; from 14.5 to 7.8 per 1000 births). Other risk factors for stillbirths are mainly related to complications during delivery and illnesses during pregnancy. We show that focusing on Comprehensive Emergency Obstetric Care and antenatal services reduces stillbirths. However, the study also underlines that illnesses during pregnancy and complications during delivery still represent the main risk factors for stillbirths. This indicates that obstetric care need still to be strengthened, should include the continuum of care from home to the health facility, make care accessible to all, and reduce delays. Background In a large population in Southwest Ethiopia (population 700,000), we carried out a complex set of interventions with the aim of reducing maternal mortality. This study evaluated the effects of several coordinated interventions to help improve effective coverage and reduce maternal deaths. Together with the Ministry of Health in Ethiopia, we designed a project to strengthen the health-care system. A particular emphasis was given to upgrade existing institutions so that they could carry out Basic (BEmOC) and Comprehensive Emergency Obstetric Care (CEmOC). Health institutions were upgraded by training non-clinical physicians and midwives by providing the institutions with essential and basic equipment, and by regular monitoring and supervision by staff competent in emergency obstetric work. Results In this implementation study, the maternal mortality ratio (MMR) was the primary outcome. The study was carried out from 2010 to 2013 in three districts, and we registered 38,312 births. The MMR declined by 64% during the intervention period from 477 to 219 deaths per 100,000 live births (OR 0.46; 95% CI 0.24–0.88). The decline in MMR was higher for the districts with CEmOC, while the mean number of antenatal visits for each woman was 2.6 (Inter Quartile Range 2–4). The percentage of pregnant women who attended four or more antenatal controls increased by 20%, with the number of women who delivered at home declining by 10.5% (P<0.001). Similarly, the number of deliveries at health posts, health centres and hospitals increased, and we observed a decline in the use of traditional birth attendants. Households living near to all-weather roads had lower maternal mortality rates (MMR 220) compared with households without roads (MMR 598; OR 2.72 (95% CI 1.61–4.61)). Conclusions Our results show that it is possible to achieve substantial reductions in maternal mortality rates over a short period of time if the effective coverage of well-known interventions is implemented. A facility-based review of records in all 63 health centres and three hospitals in Gamo Gofa zone. Neonatal mortality was measured with the second method, and emergency obstetric services were assessed through the facility-based review. The thesis is based on a thorough and systematic registration of adverse events during several years, using multiple methods. This allows validation of estimates, and it presents detailed and precise information about maternal mortality rates from rural south Ethiopia. A special focus of the work is on the finding that community based health workers (Health Extension Workers) can be used to generate maternal mortality data, thus alleviating the chronic problem of unavailability of valid and timely mortality data. The PhD thesis can be downloaded here. Recently, Yaliso Yaya, PhD candidate at The Centre for International Health wrote the following post as part of the The Maternal Health Task Force series Translating Research into Practice Series. Motorcycle ambulances have been useful for transporting mothers with complications to health facilities. The message in Amharic reads “A mother should not die while giving life.” (Photo: Demissew Mitiku). Unfortunately, there is still limited information to oversee maternal and newborn mortality interventions in low-income countries. Developing countries lack vital registrations that are present in high-income countries. Because of the shortage of such essential information, translating policy into action and monitoring programmes to reduce maternal and neonatal deaths is difficult. The new Sustainable Development Goals divide countries into three groups where the maternal mortality ratio (MMR) is greater than 400, between 100 and 400, and less than 100 based on the ratio in 2010. Such a grouping is necessary because different ratios may determine different intervention strategies. Unfortunately, for many countries there is a controversy over the level of the MMR. If we use Ethiopia as an example, a UN estimate of MMR in 2010 is 350 per 100,000 live births, whereas the DHS estimated it to be 676 for the same year. 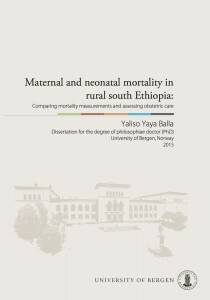 As a follow-up to our paper, Maternal and Neonatal Mortality in South-West Ethiopia: Estimates and Socio-Economic Inequality, we developed, validated, and used community based birth registration in a population of about half a million people in four woredas, or districts, in rural southern Ethiopia. We aimed to estimate maternal mortality rates and to monitor progress in reducing deaths. The most important lesson we learnt, that may be applicable in similar settings in Ethiopia and in Africa, is that it is possible to obtain high-coverage birth registration and measure maternal mortality in rural communities with trained community health workers. In southern Ethiopia, the MMR was high and most births and maternal deaths occurred at home. The MMR was about 500 per 100,000 live births in 2010, and data from 2014 show that this ratio may have been reduced by about 60%. In our experience, it is possible to register most births in rural Ethiopian communities using the health extension workers. However, we advise that a birth registry should be expanded to include registration of pregnancies as well as pregnancy outcomes. Such a system could provide the community health workers with a new tool to actively follow up pregnant women and ensure proper antenatal controls and referrals to institutions. It could also help in monitoring neonatal heath and be a tool to provide essential services to women in the weeks after birth. The aim of the RMM (Reducing Maternal Mortality) programme in Saggen, Gamo Gofa Zone and in Basketto is to reduce maternal and neonatal deaths. During the first phase (2008 – 2011), we worked to set up and strengthen institutions doing Comprehensive Emergency Obstetric care (CEmOC). Arba Minch Hospital was the training centre, Saula Hospital and Chencha Hospital, and Kemba, Basketto and Melo Health Centres started to do caesarean sections through support by our project. All these institutions are now regularly doing caesarean. The challenge we noted during the first phase was that large populations living in our target areas still have limited access to delivery services. During the second phase (2012 – 2016) we aim to increase the coverage of Basic and Comprehensive Emergency Obstetric Care. Our aim is to improve the access to delivery services. We do this by strengthening health centres to do Basic Emergency Obstetric Care. We also link the work at these health centres to health posts in the kebeles, and to improve referrals to institutions doing caesarean sections. During the last year the number of institutions doing Comprehensive Emergency Obstetric care (CEmOC) has increased by four; in Bonke woreda (Gezzeso), in Beto and in Selam Berr (Kucha), and in Kolme and in Gawada.. The map shows the institutions doing CEmOC on the area. So, The number of institutions doing comprehensive emergency care is now about one institution per 250.000 people, a great improvement since 2007 when the figure was one institution per 2.5 million people. 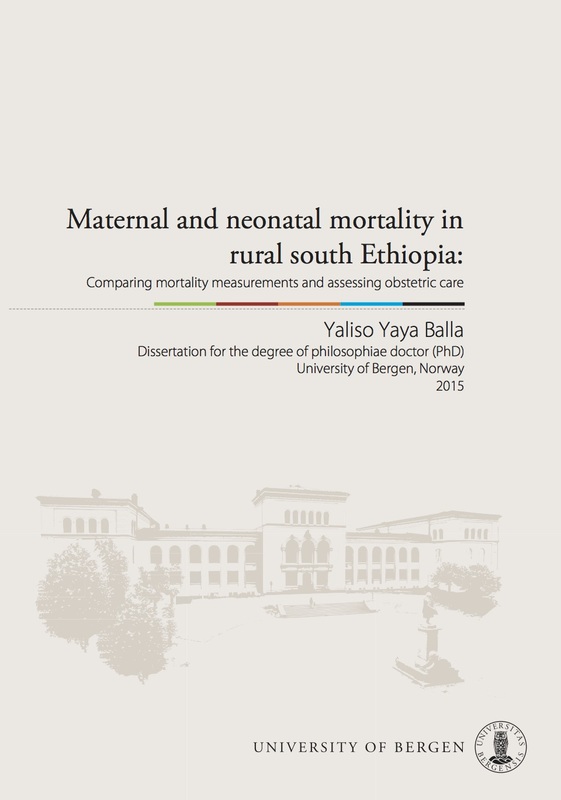 We also collaborate with the Midwife School in Arba Minch, and currently they are evaluating how well the midwives that graduated from their school are performing (See Master thesis by Rahel Tesfaye). This will give us essential information on how to improve the quality of midwife training, and thus of RMM work. To monitor this work and see if the project meets its societal objectives (reduced death rates), we register births and maternal deaths in four woredas with a population of about 600.000. In a recent research we have shown that it is possible to achieve high coverage community birth registration in rural Ethiopia. Such registration can be an important tool to monitor births and birth outcomes such as maternal mortality in resource-limited settings (Yaliso et al 2014, PLoSONE in press). Our results (unpublished) show that maternal deaths have since 2008 been reduced by 2/3. The institutional delivery rates have also increased substantially, and the use of traditional birth attendants is decreasing. We also see some early signs of decreasing neonatal deaths. In some areas the institutional delivery rates approach 60%. Even if our results are encouraging, many challenges remain. The birth registration shows that highest maternal deaths rates are among women who live in remote areas, and among women who report illness during pregnancy. One study show that children born to poor women have higher death rates compared with richer families. So, in the coming years will focus on improved quality of care, particularly focusing on improving access, and on managing illness during pregnancy. We will also try to develop tools to identify the poor that are in need of special attention. Yaya Y, Data T, and Lindtjørn B. Maternal mortality in rural south Ethiopia: Feasibility of community-based birth registration by Health Extension Workers. (Manuscript submitted 2014). Girma M, Yaya Y, Gebrehanna E, Berhane Y, Lindtjørn B. (2013). Lifesaving emergency obstetric services are inadequate in south-west Ethiopia: a formidable challenge to reducing maternal mortality in Ethiopia. BMC Health Services Research 2013; 13(1):459. Yaya Y, Lindtjørn B (2012). 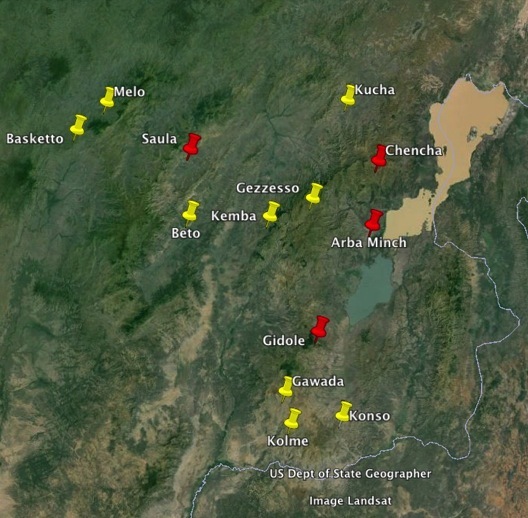 High maternal mortality in rural south-west Ethiopia: estimate by using the sisterhood method. BMC Pregnancy and Childbirth 2012; 12: 136. Rahel Tesfaye. Client Satisfaction with Delivery Care Services and Associated Factors in the Public Health Facility of Gamo Gofa Zone, South West Ethiopia. 2014. Arba Minch University and Addis Continental Institute of Public Health. For complete list of publications from this project click here. Introduction Ethiopia has achieved the fourth Millennium Development Goal by reducing under 5 mortality. Nevertheless, there are challenges in reducing maternal and neonatal mortality. The aim of this study was to estimate maternal and neonatal mortality and the socio-economic inequalities of these mortalities in rural south-west Ethiopia. Methods We visited and enumerated all households but collected data from those that reported pregnancy and birth outcomes in the last five years in 15 of the 30 rural kebeles in Bonke woreda, Gamo Gofa, south-west Ethiopia. The primary outcomes were maternal and neonatal mortality and a secondary outcome was the rate of institutional delivery. Results We found 11,762 births in 6572 households; 11,536 live and 226 stillbirths. There were 49 maternal deaths; yielding a maternal mortality ratio of 425 per 100,000 live births (95% CI:318–556). The poorest households had greater MMR compared to richest (550 vs 239 per 100,000 live births). However, the socio-economic factors examined did not have statistically significant association with maternal mortality. There were 308 neonatal deaths; resulting in a neonatal mortality ratio of 27 per 1000 live births (95% CI: 24–30). Neonatal mortality was greater in households in the poorest quartile compared to the richest; adjusted OR (AOR): 2.62 (95% CI: 1.65–4.15), headed by illiterates compared to better educated; AOR: 3.54 (95% CI: 1.11–11.30), far from road (≥6 km) compared to within 5 km; AOR: 2.40 (95% CI: 1.56–3.69), that had three or more births in five years compared to two or less; AOR: 3.22 (95% CI: 2.45–4.22). Households with maternal mortality had an increased risk of stillbirths; OR: 11.6 (95% CI: 6.00–22.7), and neonatal deaths; OR: 7.2 (95% CI: 3.6–14.3). Institutional delivery was only 3.7%. Conclusion High mortality with socio-economic inequality and low institutional delivery highlight the importance of strengthening obstetric interventions in rural south-west Ethiopia. Yaya Y, Lindtjørn B. High maternal mortality in rural south-west Ethiopia: estimate by using the sisterhood method. BMC Pregnancy and Childbirth 2012; 12: 136. Girma M, Yaya Y, Gebrehanna E, Berhane Y, Lindtjørn B. Lifesaving emergency obstetric services are inadequate in south-west Ethiopia: a formidable challenge to reducing maternal mortality in Ethiopia. BMC Health Services Research 2013; 13(1):459. Yaya Y, Data T, and Lindtjørn B. Maternal mortality in rural Ethiopia: Feasibility of community-based birth registration by the Health Extension Workers (Manuscript submitted 2014). Tadesse Data. Quality check household survey on community birth registry in Bonke woreda in Gamu Gofa Zone in South-west Ethiopia. 2011.Addis Continental Institute of Public Health and University of Gondar. Meseret Girma Abate. Assessment of availability and utilisation of Emergency Obstetric Care Services In Gamo Gofa Zone, SNNRP, Ethiopia. 2011. Addis Continental Institute of Public Health and University of Gondar. Rahel Tesfaye. Assessment Of Quality Of Intrapartum Care In Gamo-Gofa Zone, SNNRP, Ethiopia. Arba Minch University, expected to finish in 2014. Demeke Damota. Factors affecting institutional delivery in Arba Minch Town (Gamo Gofa Zone). Expected to finish in 2014. Zillo Zidda. Topic: Results of Caesarean sections done in the RMM project. Arba Minch University, expected to finish in 2015. Demissew Mitike. Topic: Increasing institutional delivery rates in Seggen Zone. Arba Minch University, expected to finish in 2015. Reducing maternal mortality in South Ethiopia: Results of a decentralised health care model (2008 – 2013): 2014 Manuscript. Lindtjørn B. Caesarean sections done by health officers in south-west Ethiopia. See Report (26. November 2009). The aim of the work is to reduce maternal deaths, reduce deaths among newborns, and increase the number of deliveries at institutions. Our work aims to strengthen the health system by improving work at institutions doing comprehensive emergency obstetrics, and at health centres doing basic emergency obstetric care. Our work, which consists of training, supervision and equipping and supporting institutions, focus to increase quality of services and better access for women to essential delivery services, and to improve health services for newborn. We thus work with health posts in kebeles, with health centres and hospitals. We collaborate with the Midwife School in Arba Minch, and currently they are evaluating how good midwives do their work after they graduated from the school. This will give us essential information on how to improve the quality of midwife training, and thus of RMM type of work. To monitor this work and see if the project meets its societal objectives (reduced death rates), we register births and maternal deaths in four woredas with a population of about 600.000. Our results show that maternal deaths have since 2008 been reduced by 2/3. The number of institutions doing comprehensive emergency care is now about one institution per 250.000 people, a dramatic improvement since 2007 when the figure was one institution per 2.5 million people. The institutional delivery rates have increased substantially, and the use of traditional birth attendants is decreasing. We also see some early signs of decreasing neonatal deaths. In some areas the institutional delivery rates approach 60%. We believe the main reason for these good results is increased access to essential health care. Girma M, Yaya Y, Gebrehanna E, Berhane Y, Lindtjorn B. Lifesaving emergency obstetric services are inadequate in south-west Ethiopia: a formidable challenge to reducing maternal mortality in Ethiopia. BMC health services research 2013;13(1):459. Most maternal deaths take place during labour and within a few weeks after delivery. The availability and utilization of emergency obstetric care facilities is a key factor in reducing maternal mortality; however, there is limited evidence about how these institutions perform and how many people use emergency obstetric care facilities in rural Ethiopia. We aimed to assess the availability, quality, and utilization of emergency obstetric care services in the Gamo Gofa Zone of south-west Ethiopia. We conducted a retrospective review of three hospitals and 63 health centres in Gamo Gofa. Using a retrospective review, we recorded obstetric services, documents, cards, and registration books of mothers treated and served in the Gamo Gofa Zone health facilities between July 2009 and June 2010. There were three basic and two comprehensive emergency obstetric care qualifying facilities for the 1,740,885 people living in Gamo Gofa. The proportion of births attended by skilled attendants in the health facilities was 6.6% of expected births, though the variation was large. Districts with a higher proportion of midwives per capita, hospitals and health centres capable of doing emergency caesarean sections had higher institutional delivery rates. There were 521 caesarean sections (0.8% of 64,413 expected deliveries and 12.3% of 4,231 facility deliveries). We recorded 79 (1.9%) maternal deaths out of 4,231 deliveries and pregnancy-related admissions at institutions, most often because of post-partum haemorrhage (42%), obstructed labour (15%) and puerperal sepsis (15%). Remote districts far from the capital of the Zone had a lower proportion of institutional deliveries (<2% of expected births compared to an overall average of 6.6%). Moreover, some remotely located institutions had very high maternal deaths (>4% of deliveries, much higher than the average 1.9%). 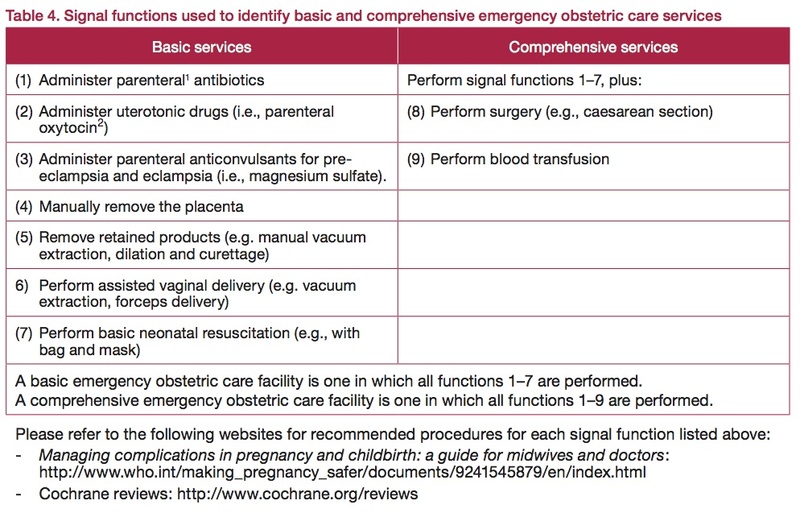 Based on a population of 1.7 million people, there should be 14 basic and four comprehensive emergency obstetric care (EmOC) facilities in the Zone. Our study found that only three basic and two comprehensive EmOC service qualifying facilities serve this large population which is below the UN’s minimum recommendation. The utilization of the existing facilities for delivery was also low, which is clearly inadequate to reduce maternal deaths to the MDG target. A recent report in The New York Times highlight the poor states and failures of hospitals in Uganda. They write about pregnant women arriving at hospitals in time to deliver, but when complications arise, no one is there to help them. The tragic events at Arua Hospital is unfortunately not a unique event. Such failures are unfortunately not seldom. The New York Times article point to the lack of priority given by the Ugandan Ministry of Health. In my view it also points to a failure over many years by the international donor communities. Where as much emphasis has been given to HIV work, and immunisations, donors and NGOs have been reluctant to support and strengthen institutions. Hospitals are essential to reduce maternal deaths. 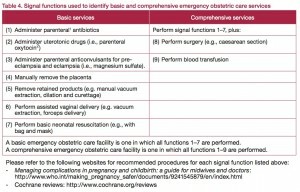 Most deaths would be averted if the pregnant women would deliver at hospitals near to their homes, and such a hospital need to have trained staff to do Comprehensive emergency obstetric care (see figure for more information). Many NGOs and donor government unfortunately believe that providing antenatal coverage is enough to reduce maternal deaths. Unfortunately, such logic is only true to a certain extent. Good antenatal services will reduce maternal deaths if it works jointly with hospitals. Antenatal work in the communities and at peripheral health posts must in time refer women in need of comprehensive emergency obstetric care. Experience from many countries show that antenatal care as stand-alone work will not reduce maternal deaths. In our project in Ethiopia we try to improve the quality of hospitals, and support the Ministry of Health to upgrade health centres to small hospitals so pregnant women can get use essential services near to their homes. The aim is there should be one well-functioning institution providing comprehensive emergency obstetric care for every 150.000 people. Copyright © 2019 International Health Research. All Rights Reserved.